The same equipment casinos use! 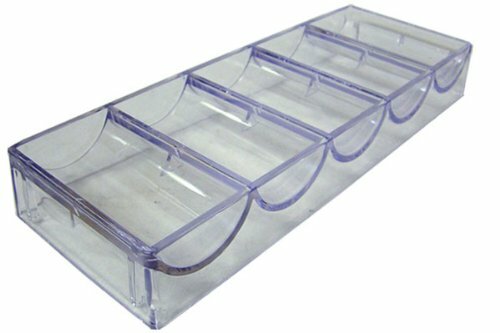 Thick, durable acrylic holds six decks and features a finger slot for easy card pick up. This poker tray is equipped withsix rows which hold upto 50 chips each. The center two rows areoutfitted to hold quarters. Two decks of cards easily fit in theholder provided. 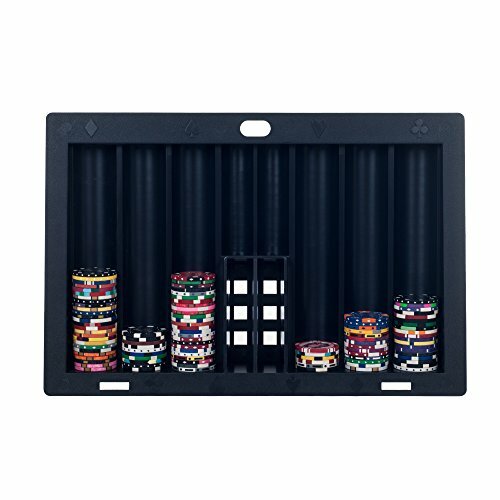 This tray is made of a thick durable ABS plastic.The dimensions are the same as in the casino poker room tablesaround the county. Make your next card game easier with this six-deck, rotating/revolving card tray. This revolving card holder is perfect for any card game with give and take hands. 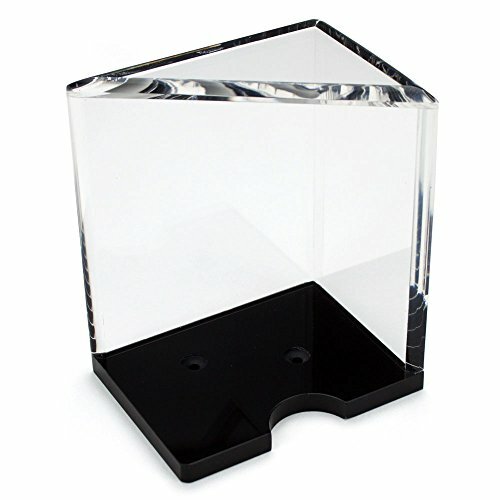 Made of sturdy plastic, the clear holder swivels on a turn table base to make drawing cards easier. Each tray can hold up to six decks of standard playing cards, including Kem or Copag. The holder fits both narrow and wide-size cards. These special 68mm width trays perfectly fit cermaic casino chips like Paulson and Claysmith, which are a little smaller than other chips. Typical poker chip trays are 70mm wide. If your ceramics aren't fitting snug in your trays, this is the tray you need. Holds up to 100 chips. If you want to bring a taste of the casino to your at-home game nights, this 10-Row Plastic Casino Dealer Chip Tray is the perfect idea. Whether you are building a table, or just need a way to store your poker chips when they aren't in use, this tray is a great solution. Each poker tray has ten rows that hold up to 50 chips each, or 500 chips total. 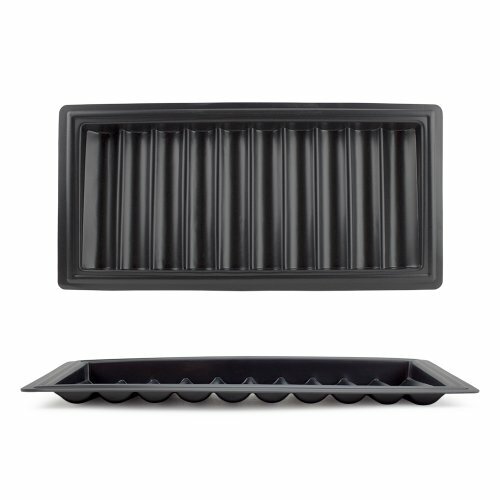 This tray is made of thick and durable ABS Plastic. This item measures approximately 18.5 inches long and 9 inches wide. If you are building a table, the hole cut out should measure 17 inches by 7.25 inches. The outer lip dimensions for this tray measure 18.38 inches by 8.88 inches. However, we do recommend that you wait to receive the product before cutting any hole in your table. This stylish and practical Casino Dealer Chip Tray is sure to impress your poker buddies. It also makes a great gift idea for the avid poker player. 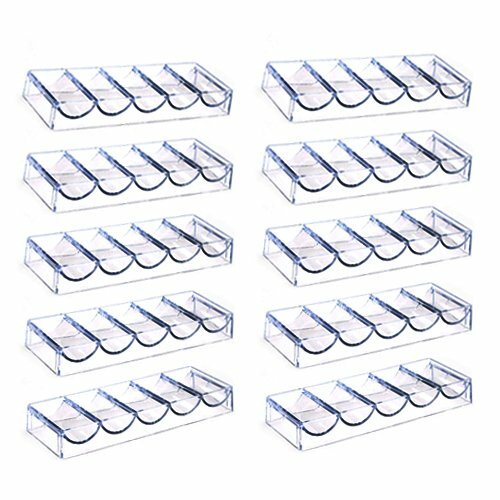 Ten acrylic chip trays hold 100 poker chips each. Twenty chips in a row, five rows per tray. For home or professional use. 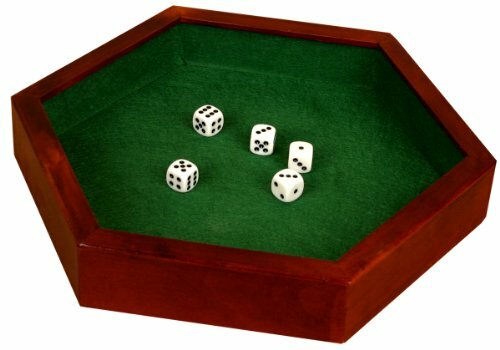 This 14.5" hexagonal dice tray features a deep wooden design with a felt rolling surface and includes a set of 5 dice. Perfect for all games that require rolling dice such as backgammon. 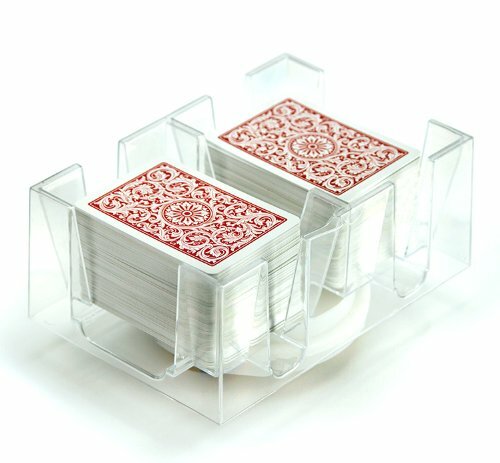 This acrylic poker chip rack is made of high quality durable clear acrylic. Each poker chip rack has 10 rows that hold up to 20 chips each, or 200 chips total. Each rack comes with a cover. Each tray and cover set measures approximately 8.26 inches long,6.69 inches wide and 2.95inches height.Great for home or professional use.1 rack & 1 cover per order. Bring the feel and style of Las Vegas casino to your home with this stylish and professional size poker table dealer chip tray. 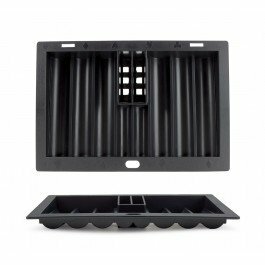 Made of heavy duty ABS plastic, this dealer chip tray is the perfect solution to install in your home made poker table or other game tables. The tray has 6 rows with each row holding up to 56 standard size poker chips for a total of 330 chip capacity. There are also 2 center slots for quarters, chip spacers, or dealer buttons. There is also space for 2 decks of playing cards as shown. Dimensions of the tray on top are 14 3/4 long by 10 inches wide. The tray can simply be placed on top of the table or you can install it in a table if you are building your own poker table. If building a table, the minimum required cut out size should be 13.5 x 8.25 inches, but please wait until you receive the tray and make your own measurements. 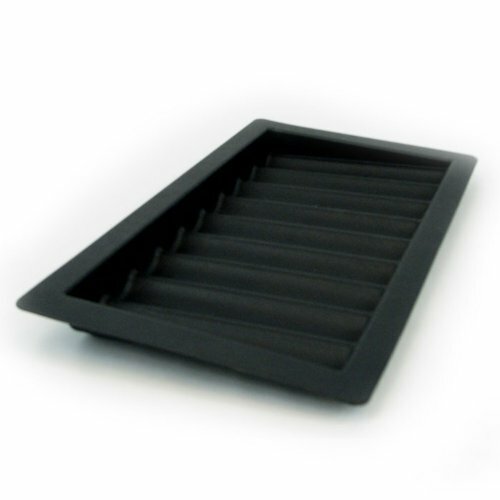 9 Row molded chip tray holds 450 chips. Made of thick ABS plastic. This is not the cheaper tray that is sold elsewhere for less. 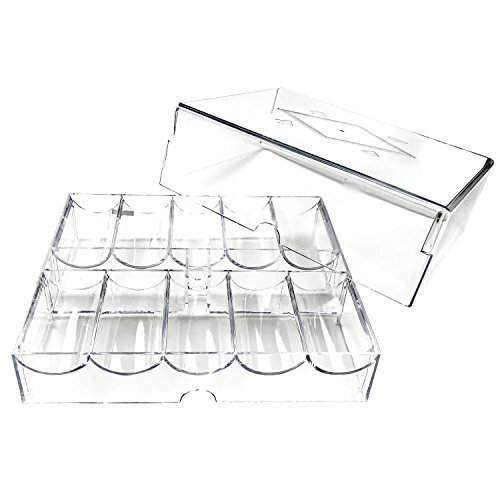 This transparent and stackable acrylic chip tray is used to carry 500 pieces of standard casino jetons with diameter of 39mm. Also used in cashdesks and safes to store jetons. Compare prices on Casino Tray at ShoppinGent.com – use promo codes and coupons for best offers and deals. Start smart buying with ShoppinGent.com right now and choose your golden price on every purchase.